The Skirmish at Hithlum (155 Y.S.) 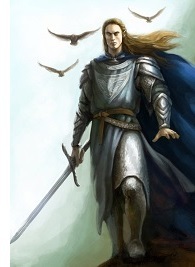 - After the Dagor Aglareb (Third Battle of Beleriand), both sides had been thoroughly depleted, and neither had the strength to wage all-out war. So they essentially entered a war of attrition, with neither side launching an assault. Morgoth remained safely behind his walls in Angband, and the Noldor kept constant watch on the fortress for any signs of movement. In this manner, there was relative peace in Beleriand for some four-hundred years. The one exception was the Skirmish at Hithlum in 155 Y.S..